From the sky, Gwadar looks like a dust bowl as the ATR aircraft, which regularly flies along the Makran coast from Karachi, circles in for landing. The new airport, currently being designed, will be the largest in Pakistan once it is completed, but for now one has to settle for the old airport. Its VIP section is used often as ministers, senators and even the prime minister and the army chief regularly visit this once sleepy fishing port. 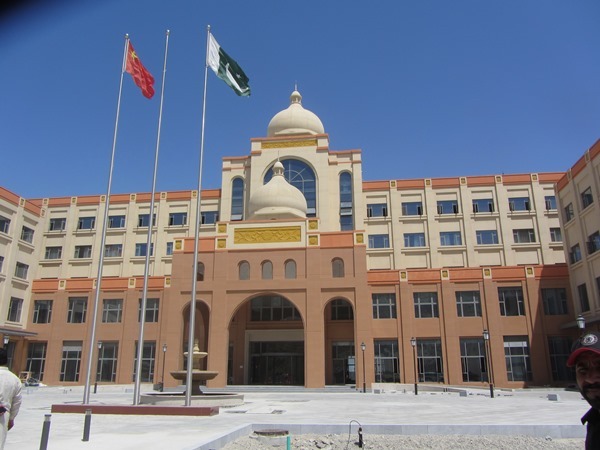 They have all proclaimed Gwadar to be the jewel of the upcoming China-Pakistan Economic Corridor(CPEC). The drive from the airport along the newly built corniche (a wide road bordering the blue sea) is promising. However, other than this new road, there is very little visible development. Billboards proclaiming future housing estates are still to be found everywhere. Land speculation is continuing at a frantic pace, with property being bought and resold at exorbitant rates. However, a recent ad taken out by the Gwadar Development Authority in one of the Urdu papers has just declared a major chunk of these “housing estates” to be fraudulent. The vision of a city of skyscrapers rising out of the sand is still far from being realised. “The dream of a new Dubai is downloading at the moment – we are just having connectivity problems”, joked Sajid Baloch, one of the local journalists we met. For now, Gwadar is a thirsty town where electricity comes and goes and water is so scarce that the local fishermen tell me they haven’t bathed with clean water in years. The last cyclone hit Jiwani in 2007, bringing heavy rains along the coast. In the last three years, it has not rained at all, drying up the local Akra Kaur Dam, which provided drinking water to Gwadar. At the moment, everyone is dependent on tankers to fetch water from as far as the Mirani Dam in Turbat. “Tube wells are no good here – we only get brackish water which is not even fit for bathing,” said Abdul Majid, one of the fishermen we met. There is garbage everywhere, for no one comes to collect it and the wind whips it up. 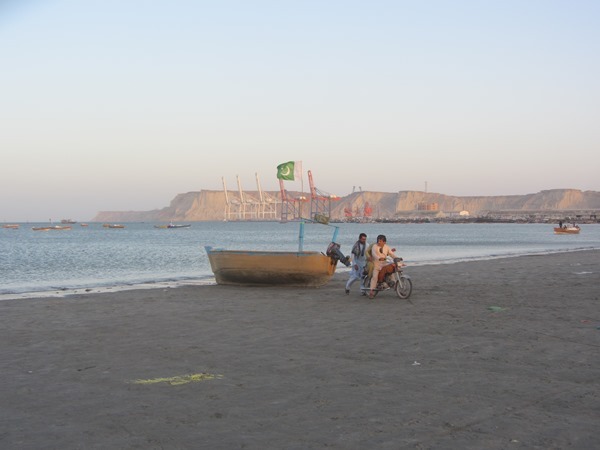 Gwadar means “door of winds” in the local language, and there is always a breeze on the hammer head shaped peninsula jutting into the Arabian Sea. We walk around the old part of town the next day – the roads are full of potholes and there are demolished buildings everywhere. 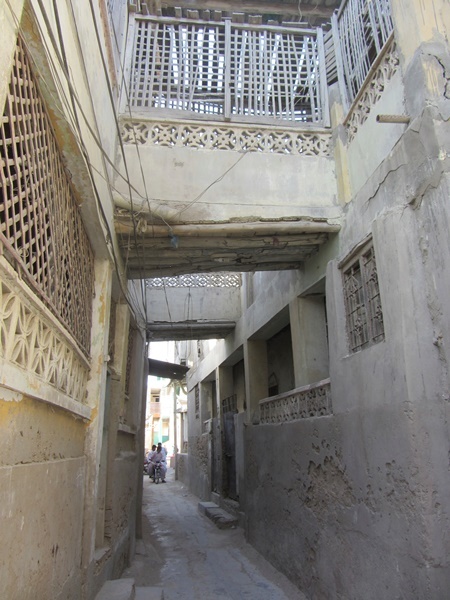 It is disappointing to re-visit the oldest and most historical part of Gwadar, the Ismaili quarter. It has fallen further into disrepair, and it seems almost all the Ismaili families (followers of the Aga Khan), who had been living here for four generations, have now moved abroad. The multi-storied buildings, which could easily be restored, with their wind catchers and wooden balconies, are now rotting away. The 16th century Portuguese watchtower, made of sturdy coral bricks, is still intact, but the staircase leading up to the rusted canon is boarded up. Near the tower is the Ismaili Jamaat Khana, which was built in 1805, and one can still see the Portuguese influence in the architecture. The building is well maintained but padlocked – it only opens up during prayer timings. Gwadar has always had an interesting history. Long after the Portuguese left in the 16thcentury, for almost two centuries it was owned by the Sultan of Oman. In 1781, the Khan of Kalat granted an exiled prince of Muscat the revenues of Gwadar as maintenance, while he lived on the Makran coast. 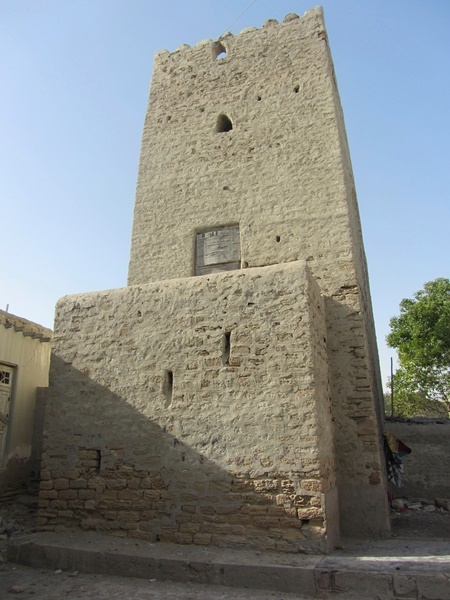 The prince later returned to Oman and became the Sultan, but he did not return Gwadar to Kalat. In 1839, the British conquered Kalat. After Pakistan came into being in 1947, the Pakistani government once again took up the question of the ownership of Gwadar. Finally, Pakistan’s then Prime Minister Sir Feroze Khan Noon entered into negotiations with the British, which resulted in Gwadar being returned to Pakistan in 1958. Today, the idea is to capitalise on Gwadar’s location near the Persian Gulf and turn it into a high-tech duty free zone and regional shipping hub. The state-owned China Harbour Engineering Company Group is working at a furious pace at the deep sea port, which we visited on our last day in Gwadar. According to the Director Operations for the port, Phase I is now complete, with four ships being handled per month, and work has started on Phase II, which will see the port being expanded. With its smooth roads, greenery and signs in Chinese, the port seems like another country once you pass the security checks. The Chinese workers live in their own China Town inside the port, and in a span of just six months, they have completed a brand new Business Centre, complete with hotel rooms, an auditorium and office spaces inside the duty free zone. 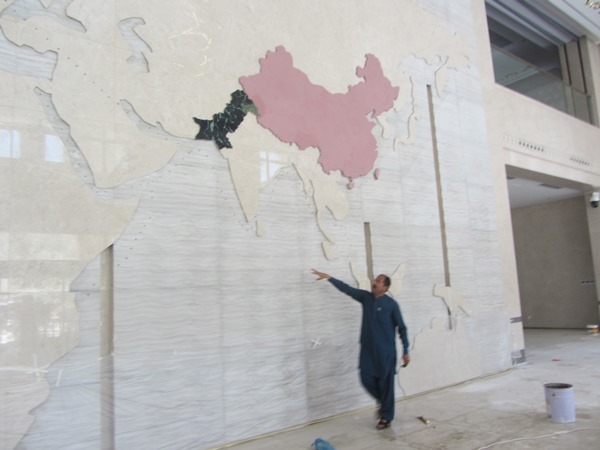 In the lobby is a large marble mural showing the map of Asia with China in pink and Pakistan sticking out in green. A line of dots, which light up at night, show the new trade routes to be created by CPEC, from the west of China, through the high mountains, and down across Pakistan to Gwadar and beyond to the Middle East by ship. The deep sea port has now been dredged to a depth of 14.5 metres, and ships are regularly coming in to berth. 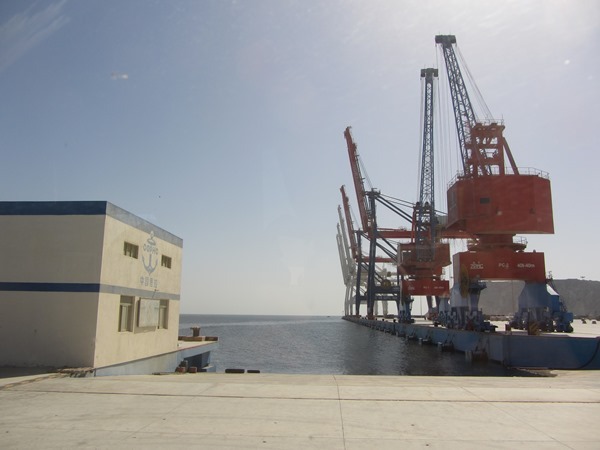 The people working for the Gwadar Port Authority say there has been a lot of progress in the last two years. The duty free zone opened up in January this year and already they have held a large expo at the Business Centre. 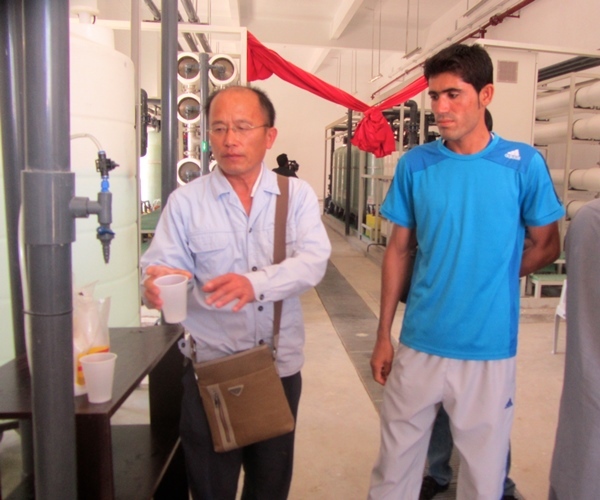 There are now two state of the art desalination plants inside the port built by the Chinese. The larger one, which can provide 254,000 gallons of clean water per day, has just signed an agreement with the Government of Balochistan to supply water at Rs0.80 a litre for the people of Gwadar. Now the tankers can fill up here and no longer need to go all the way to the Mirani Dam. The Pakistan Army is also hurriedly making a large new desalination plant with the assistance of the UAE and Swiss governments, which will provide the local people with 4.4 million gallons of water per day soon after Ramazan. An imported coal-based power plant, which will supply 300MW of electricity to Gwadar, is also being constructed by the Chinese around 20 kilometres from the port. There is also talk of getting electricity from nearby Iran, and opening up the border for trade and visitors. The Army has supplemented the local hospital, bringing in specialist doctors, while the security in this area has also vastly improved. Currently, there are security check posts all over Gwadar, and everyone carries their ID cards with them. Baloch nationalists have opposed this new development but in the last two years, the Army, which is guaranteeing security of CPEC, appears to have taken control of the area. The army officials we met during our visit all explained that Gwadar and CPEC are in fact vital to Pakistan’s future economic survival, and they are just as determined as the Chinese to ensure this dream becomes a reality. Pakistan’s Balochistan presents a new rap king!